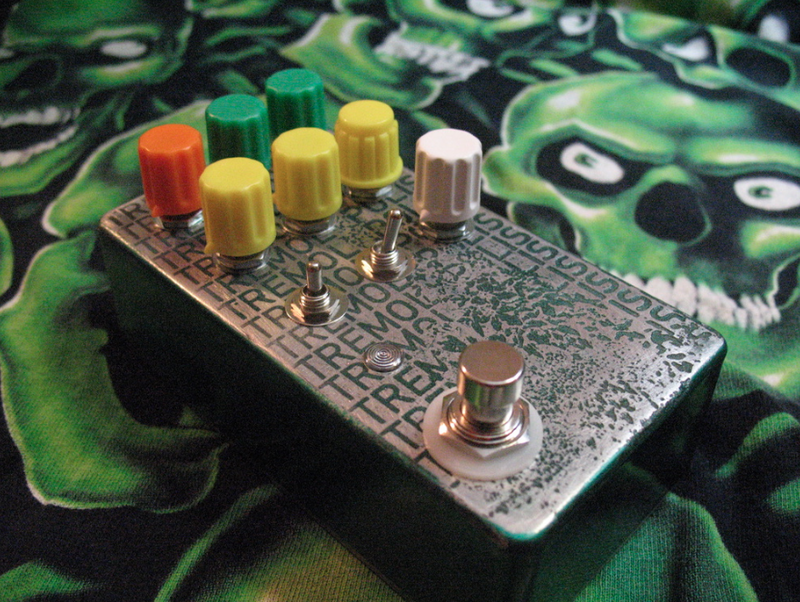 A pitch tracking/envelope following tremolo/filter/ring mod. The Belladonna is a delay with a frequency modulated oscillator folding itself into the feedback path, giving drifting tremolo/modulation, rising/falling repeats, warped bell like harmonics, and more. 3xO- offsets: these 3 knobs work together to offset the amplitude, slope, and period of the frequency modulation/wavefolding. A resonating delay, using a sextet of filters pulling highs, lows, and cross sections of frequencies from the delay path, creating hollow distant echos, distinct rhythmic thuds & chimes, to ringing swells of intense but controllable feedback. A pair of ring modulators, one with frequency modulation, one with pulse width modulation, working together to give subtle warbling & tonal changes, shimmery phasing filters, to screaming waves of pitch following space sirens! An asymmetrically clipping boost-fuzz, with gated sub octave/frequency tripling. Go from a mild drive to smashing through walls. Using a very limited stock of nearly impossible to source transistors, I was able to produce only 2 of this revision. Hand wired point to point, at 3am, on the 13th of August, on the beach of Worlds End, underneath the Perseid meteor shower. A lm301ah and a handful of tropical fish, in a comparator configuration with a high pass filter in the feedback loop. Ring- changes the feedback/input impedance for the circuit, causing shifts in filter frequency, gain, headroom, and compression.